At Camp Bow Wow Hudsonville, we believe every dog should have a loving fur-ever home. We work closely with local shelters and rescues to help with their adoption efforts, and often have foster dogs staying at Camp. These dogs get to play all day with other Campers, snooze the night away in individual Cabins, and get lots of love and attention from our Certified Camp Counselors®. Personality: Meet Eileen, our new foster dog! 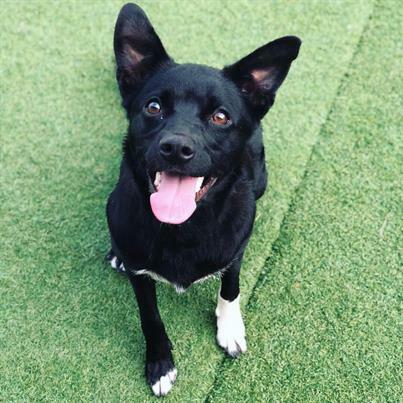 Eileen is a 3 year old spayed border collie mix who is roughly 30 pounds! This sweet girl is full of energy and cuddles! She is good with other dogs but definatley needs to be in a home that is active and willing to work on some basic commands. Feel free to stop in, call, email, or Facebook Message us for more information or to set up a visit!